Often a lump in that place is due to an infection – there’s a lymph gland there – but that should go down when the infection finishes and not be long-term. I’m not 100% sure but it might have been the effects of a goiter – indicating a thyroid malfunction. It’s a little high but some images on the web seem to indicate that sometimes there is swelling under the jaw as well as in the neck. If she didn’t dress tightly, hiding her build, then a casual observer may just have thought she’d put a few pounds on with the puffiness under her chin. Apparently if the goiter causes hyperthyroidism (too much thyroid being produced) this can cause fetal tachycardia when the woman becomes pregnant. Which might explain the loss of the child in January. It also might explain her dreadfully fast fall from grace. The historian Retha Warnicke built a fascinating hypothesis on the basis that she had given birth to a deformed fetus. What if her reasons on the fast processes were true but not because of the child she lost but because she had developed a lump under her chin, round her neck that indicated some illness. We know how paranoid Henry was about illness – that would definitely motivate him to set in motion the processes that would eventually lead to her execution. Maybe he waited until she was back at court – to see if she was better? – then when he saw she still had the swelling, he got onto Cromwell to get things in motion. 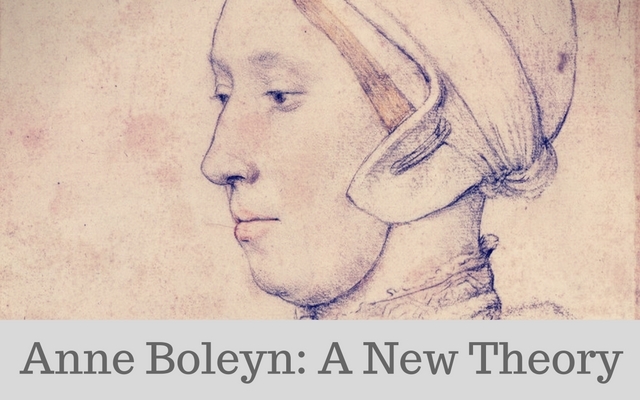 Note from author: Further to my slightly provocative post suggesting that maybe Anne Boleyn might have suffered from a thyroid malfunction, a further thought occurs to me on this subject. Problems with your thyroid can cause your eyes to slightly bulge and one of the insults supposedly said at her coronation was that she was a *goggle eyed* whore. Suggestive? Good theory. I wonder, though, if this could be the sign of some type of edema? If it was timed with a pregnancy? perfectly legitimate response – it’s certainly a very strong reason. Didn’t Anne have dark hair? It’s in the wrong place for a thyroid goitre. That would be lower down in the neck and not where this swelling is placed. More likely is a salivary gland swelling or a lymph node. Fair enough – I was very taken by the pudginess of the chin as Anne was famously slight and, being in her thirties, was too young to have developed the jowls of age. Having seen a salivary swelling before, I don’t believe this is one. Lovely drawing of a blonde haired woman who is a bit chubby. That is not a goitre. We will never know for sure who it is ..
To me, this picture look like an older version of Catherine of Aragon. She was portrayed with reddish blond hair in her portraits. I don’t believe that Ann Boleyn would have ever worn a hat like that. She favored the French styles. I’ve been looking into this idea and searching for articles because a) I’ve recently been have diagnosed with a hyper active thyroid and b) I love anything Tudor but it was the expression “goggle eyed” that really got me thinking. The symptoms do fit with a number of articles I’ve read about Anne – how she lost weight and became anxious, irritable and hysterical. A hyper active thyroid could also interfere with getting pregnant and carrying a child to term. Nowadays, of course, there are treatments that help with this but in Tudor times the poor woman would have been in a pitiful state. If I could just touch on mine again, I wasn’t diagnosed until my symptoms had reached an advanced state and I recognise a lot of my symptoms in reports of Anne, especially after the birth of Elizabeth. Now, she could have just been stressed by the pressure she was under but I still find the idea of her having a thyroid problem very interesting. Ann suffered from milk leg (phlegmasia alba dolens) following her pregnancy with Elizabeth. This is caused by deep thromboses to the deep arteries, edema (swelling) of the limbs with reduced circulation to outer blood vessels, causing the skin to turn white. This would prevent her from dancing, as her legs would have been heavy and painful, not to mention ugly. This would have been a turn-off to Henry, for sure. If she had the goiter problem (which can affect under chin and neck, he would have been repelled, and considered her diseases, even to the point of being cursed. His aversion to her was way overboard for the loss of a child. He loathed her. I think the picture is deceptive. The band of the nightcap, which is under the chin, gives a false impression. A goiter would also be much deeper. As a nurse I have seen many a goiter and don’t believe that the woman in the picture has one. Anytime a woman must tie a string under her chin it seems to give the appearance of a double chin when really it is just the look created by said string. I totally agree with Katie. Most people who have a tie holding any form of headdress on will have a slight double-chin, especially if the person is pregnant too. I also noted that the woman is looking downwards, so again this would give the appearance of a double chin. 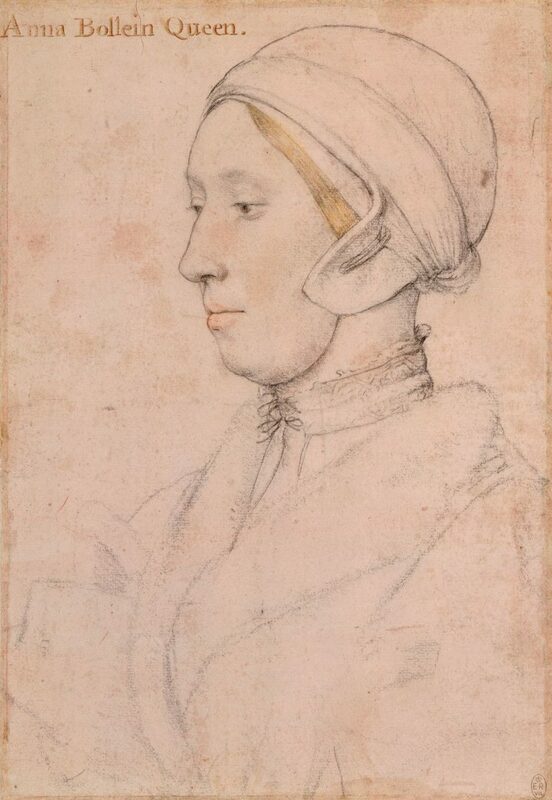 I am convinced this is a sketch of Anne Boleyn, drawn by Holbein from life. She was his patron and as such is likely to have allowed him to sketch her even when she wasn’t wearing her finery! David Starkey and another historian (I forget the name) have recently declared that the inscription “Anna Bollein Queen” was written on the sketch at the time of the drawing, not later on as previously thought. I thought this after looking at that picture this evening. I have hypothyroidism and everything about her change of appearance said she had it to me. Mine started in pregnancy. It also explains some of her daughter, Elizabeth’s health problems as she aged….hair loss etc., you can develop hypothyroidism or hyperthyroidism if it’s in the family genes. I believe in the 16th century “goggle eyed” meant blinking. Check ou the Animatronic Elizabeth face on-line – it resembles the Holbein Anne. I agree that a throid problem could have caused some eradic behavior and pregnancy problems.